We, the International League of Peoples? Struggle (ILPS), condemn in the strongest terms the US, NATO and their puppet forces for their barbaric military campaign against the people in the whole of Libya since several months ago and in Tripoli currently. The combination of escalated NATO air bombardments and ground movement of Libyan puppet forces and NATO special forces against Tripoli since 20 August aims to deliver the final blow on the Gaddafi regime. The invasion of Tripoli is the culmination of the bloody bombing campaign against the people of Libya by the air and naval forces of the US, UK, France, Italy and other NATO powers since March in collusion with Qatar and the United Arab Emirates and the most reactionary and treasonous elements of Libyan society, including high bureaucrats recruited by the CIA from the Gaddafi regime, monarchists, warlords and Islamic fundamentalists associated with the CIA and al Qaeda. The brutal campaign against Libya and the Gaddafi regime has been unleashed by the US and NATO under the pretext of saving civilian lives under Resolution 1973 of the UN Security Council. In fact, this so-called humanitarian intervention has been characterized by wanton bombings of homes, churches and civilian infrastructure, including power and water utilities, hospitals, children creches and schools, resulting in the killing and maiming of thousands of Libyans. Accompanied by covert agents and special forces of the US and NATO, the anti-Gaddafi Libyan mercenaries have been able to advance from one point to another only after being preceded by NATO bombardments on the military positions of the regime as well on civilian communities regarded as pro-Gaddafi. Subsequently, the anti-Gaddafi mercenaries mostly play-act as fighters before the TV camera, attack helpless civilians off the camera and serve as bait to lure out the pro-Gaddafi forces for attack by helicopter gunships and predatory drones. The cowardly military campaign of bombardments, involving more than 20,000 sorties by the air forces of the US and NATO and already costing more than 1 billion USD are intended not only to ruin and subjugate Libya but also to test he accuracy and killing efficiency of the weapons systems. The murderous campaign has been complemented by an internationally-coordinated psywar campaign by the biggest media conglomerates to justify foreign military intervention and aggression against the national sovereignty of Libya and the Libyan people and to misrepresent the puppets as democratic forces . By their brazen acts, the US, UK, France and Italy have exposed their scheme of turning Libya into a neocolony deprived of sovereignty, putting the country’s oil and other natural resources under their absolute control through puppets and punishing Gaddafi for his refusal to allow the US African Command to build its military base in Libya, and for declaring that he wants to retract and re-nationalize what he has conceded to the imperialists since 2003 and to replace the US dollar with the gold dinar as the medium of buying oil from Libya in the face of the sharp worsening of the crisis of global capitalism. When the US unleashed its war of aggression on Iraq in 2003, the Gaddafi regime worried as never before that the US could unleash a similar war against Libya. Thus, it decided to have rapprochement with the US, Britain and the other NATO powers. This enabled the imperialist powers to impose fully the policy of neoliberal globalization on Libya, which resulted in extreme privileges for the multinational corporations, wanton corruption among regime’s officials as well as Gaddafi relatives and in significant rises in the prices of basic commodities, in erosion of social benefits and in the mismatch of qualifications and jobs among the youth even as Libya continued to have the highest standard of living in Africa. The Gaddafi regime also went into military and intelligence cooperation with the US and the other NATO powers, especially with regard to military supplies and the so-called US global policy of war on terror. Through expanded economic and military relations with Libya, the imperialists and particularly their intelligence operatives were able to gain influence among the officials of the Gaddafi regime, to recruit some of them and turn them against Gaddafi and his relatives. Thus, we now see former high officials of the Gaddafi regime in leading positions in the National Transitional Council. The strategy of the US and NATO to overthrow the Gaddafi regime involves the use of bombardments on military positions and formations, on communities deemed as hostile and on the social infrastructure; the freezing of financial assets abroad; and the blockade on essential supplies, especially food and medicine. These brutal measures are calculated to allow the puppet opposition on the ground to rouse the people against the regime. 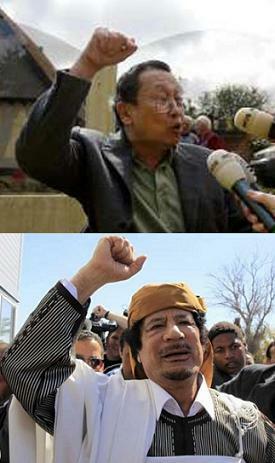 The imperialist powers have boasted that they shall have finished off Gaddafi by the 27th of June. But they have failed and have reset their deadline to end of September, although they now claim to be well ahead of schedule. They have also boasted that they do not have to put their boots on the Libyan sand. In fact, they are planning to deploy their troops in Libya under the cover of UN peacekeeping. Their covert agents, advisors and special forces are already in Libya to guide the puppets. Under the imperialist powers, the Libyan constitution will be replaced with one that institutes a puppet republic serving the economic, political, military and cultural interests of the imperialists. Libya will be made to accept the establishment of the military base of the US African Command and thus become another military outpost of US imperialism like Kosovo, Afghanistan, Iraq and elsewhere. To dominate Libya, the US and NATO will certainly continue to promote puppetry and treason and to manipulate the differences among the various puppet political forces, the tribes, the secularists and Islamic fundamentalists in order to divide and rule the Libyan people as in Iraq, Afghanistan and elsewhere. The ILPS wishes the Libyan people and their anti-imperialist and democratic forces to take advantage of the current social and political turmoil in their country in order to gain strength and override the current conflict of the pro-Gaddafi and anti-Gaddafi forces. The turbulent conditions and the widespread distribution of arms in Libya today are favorable for establishing a revolutionary party of the working class as well as for developing a national liberation movement. The Libyan people should not be limited to choosing between the Gaddafi regime and a new regime of puppets extremely servile to the US and NATO. At any rate, a new regime of traitors conflicting with each other and having their respective armed groups is bound to be unstable. Whether Gaddafi becomes a martyr or remains alive to exercise leadership over his followers, the Gaddafi camp can redeem itself through continued anti-imperialist struggle and remain a major force for fighting the imperialists and traitors and for contributing significantly to the rise and growth of a national liberation movement. We are confident that the Libyan people will continue to draw courage and strength from their long and proud tradition of fighting colonialism and imperialism and to advance on the road of national independence, democracy, social justice and development. They should not allow the Arab spring to be merely a way of empowering a new set of rulers that is more servile to US imperialism than a previous one. We stand firmly in solidarity with all the people of Libya in fighting for national independence and democracy. We call on ILPS member organizations and all friendly forces to promptly mount protest actions at the embassies of the US and other NATO powers involved in the current assault on Tripoli and in the entire barbaric campaign against Libya and the people of Libya. Uphold and defend the national sovereignty and democratic rights of the people of Libya! Down with US and the other imperialist powers in NATO! Get out of Libya! Long live the people of Libya! Onward with the struggle for national liberation and democracy!